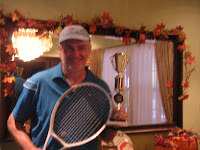 Congrats to Robert Nazy on meeting up with 20 Tennis Los Angeles Partners over the 10 week Spring season. It takes a great amount of effort and passion to make it happen. Per the $10 for 10 rule, Tennis League Network has given Robert a free season for his dedication. Here's Roberts comments on the season: "Thank YOU for setting up the league. I enjoyed playing all the guys and it was a challenge adapting to the different styles of play. Most all the guys were friendly, personable, and most importantly, all had decent weapons on the court with which to compete at a high level of play. I had some very tough matches, which were the most enjoyable. It’s much more fun when the game is close and I get pushed physically and mentally."